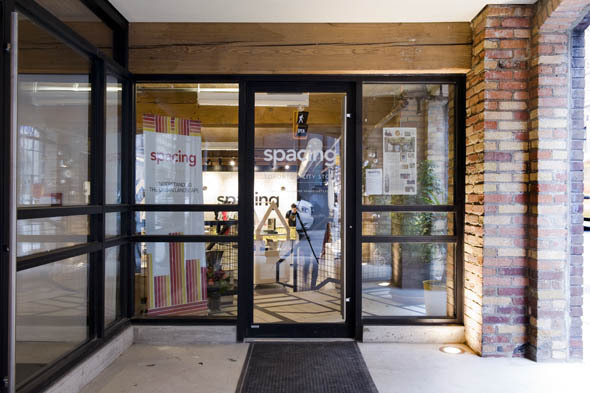 Spacing Store is the brand-new retail offshoot of the magazine of the same name. 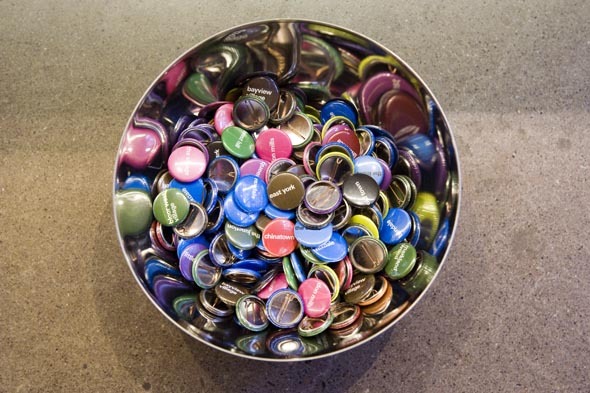 The store, located on the ground floor of the 401 Richmond building , is a natural culmination of the years the independent mag has spent championing the city in print, as well as immortalizing its various idiosyncracies and identities through its own line of merchandise. After years of selling back issues and other paraphernalia online, publisher and founder Matthew Blackett says the expansion was born out of necessity. 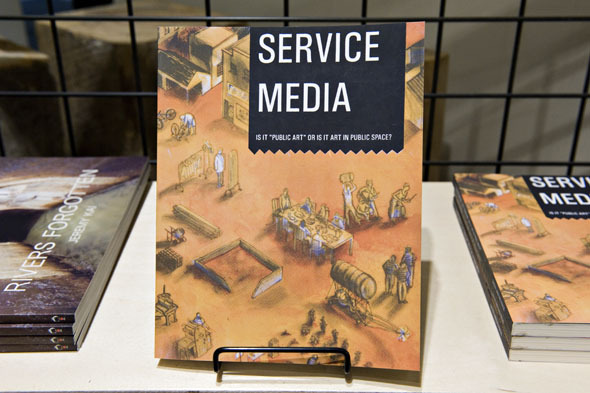 "It got to the point where it was hard, in our office, which was only about 250 square feet, to maintain the stuff that we had, run a magazine - with lots of boxes of magazines, when they come in - and then other people's stuff," Blackett says. "It just became not only a business idea, but also became a logistical thing." They teamed up with 401 Richmond's ownership, who were looking to convert the sunken, street-level unit from storage space into something that would engage the surrounding community. 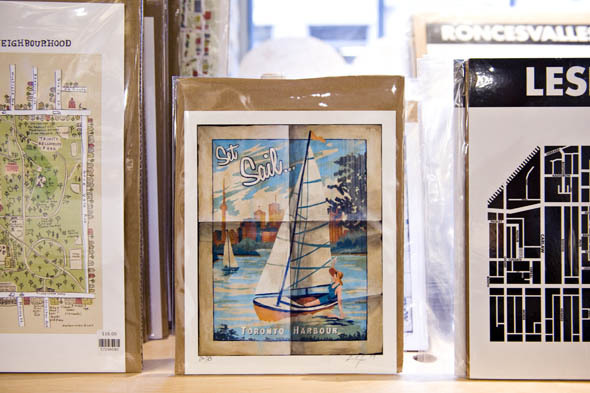 Now, the industrial-chic, glass-and-concrete space is packed to the gills with prints, clothing, books, and gifts. Naturally for Spacing, you'll find a far more locally-oriented and design-minded selection of products than at your typical tourist-trap souvenir shop; their menu, Blackett says, is "no moose, no beavers". "The city is much more complex and dynamic than that. 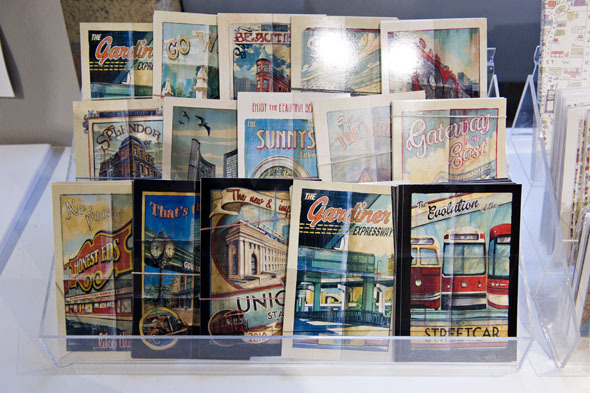 There is an iconography to the city that I don't think people necessarily realize." The Toronto spirit is further represented in custom-built decks by the student-run Oasis Skateboard Company, as well as oddities like bacon-scented Hogtown Peameal candles from Smells Like Canada . "How awesome is that?" Blackett enthuses. "Toronto used to smell like an abattoir, so you might as well have a candle that smells a lot better than an abattoir." 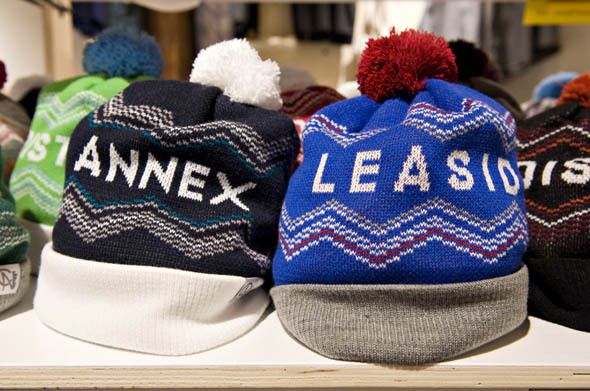 The selection also veers into city-friendly pieces that aren't quite so Toronto-themed. An entire shelf is loaded with cycling-themed gear, including Cleverhood rain capes ($240), bike-friendly button-downs, and wine bottle or six-pack holders meant to clip to your handlebars or frame. 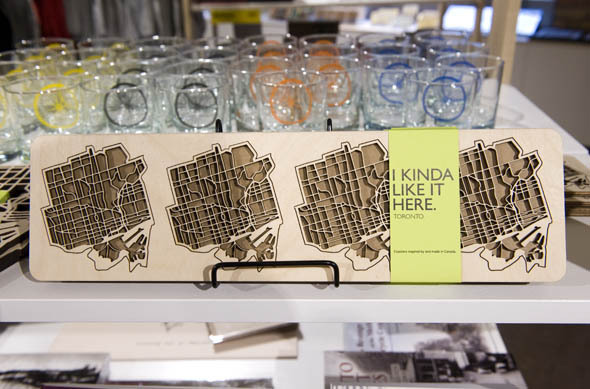 As Blackett says: "It's a mixture of the things that are urban about the city, but also what is unique to Toronto." 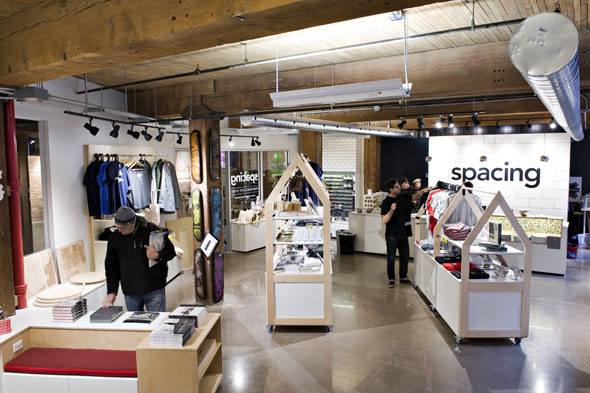 Though the shop was born out of Spacing's own practical demands, the team also sees the project as tackling a real void in the city's retail scene. 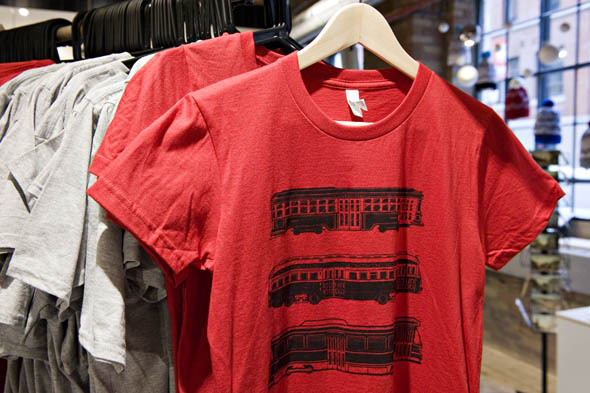 The demand among Torontonians for clever, well-designed merchandise celebrating the city is clear - Spacing's presence at events like Word On The Street has grown year over year, culminating in a pop-up shop last fall that brought in over $25,000. In recent months, Blackett says, the Spacing team has been running tours down to the Detroit area: "They have six stores dedicated to Detroit. I think Detroit's amazing - there's a lot of mythology around it, and that helps. But if Detroit, in its current state, can have six city stores, Toronto can at least have one. "We feel like we're filling kind of a niche in the retail market, the way we filled a niche in the publishing world when we started Spacing."